Low rates and a hunger for uncorrelated returns are fueling demand for bonds insuring against catastrophes, like the World Bank’s new deal for Mexico. Yields on these instruments have fallen even as issuance has soared. Disaster, if it strikes, may only increase their popularity. 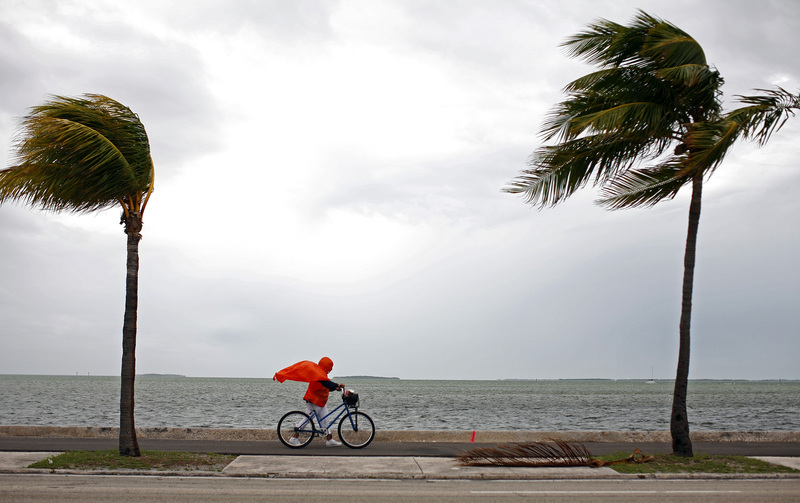 A woman walks her bike on an island in the Florida Keys September 8, 2008. The Atlantic Basin is projected to have 16 named storms and eight hurricanes this season, according to the Colorado State University Tropical Meteorology Project. This is above the 30-year average of 12 named storms and six hurricanes. The forecast was increased in April, June and July. The World Bank said on Aug. 4 it issued $360 million worth of catastrophe bonds on Mexico’s behalf. If the country has damaging hurricanes or earthquakes, the bonds will pay out to the country for disaster relief. Separately, insurers and other entities have issued $10.6 billion of catastrophe bonds so far in 2017, according to Artemis. That exceeds issuance in any other full year, including the previous record of $9 billion in 2014. In July, bonds and insurance-linked securities were issued against the risk of earthquake in Japan, pandemics worldwide, and storms in the United States.